Jesus said “Learn from me, for I am meek and humble of heart.” Humility is basic to gospel spirituality. The kingdom of God belongs to the poor in spirit. God resists the proud; he raises up the humble. We must stand before God humbly in our daily prayer, and have the attitude of a servant. Jesus calls us to follow him even unto death. He asks us to die to sin daily. St. Vincent knew these gospel imperatives very well. We must be faithful to our duties of serving the poor, and prefer them when they conflict with other more pleasurable things. Vincent loved, with a burning love. 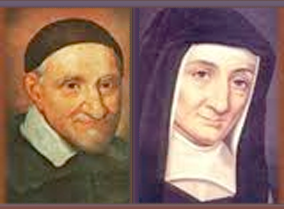 “Let us beg God to enkindle in our hearts a desire to serve him…” (SV XI, 75.) We must labor long as servants of the poor– while remembering that although the Lord asks us to cooperate in his work, it still remains His work. So we must strive to live a balanced life, so that we might have the energy that nourishes zeal. The Christ of St. Vincent came to preach good news to the poor. 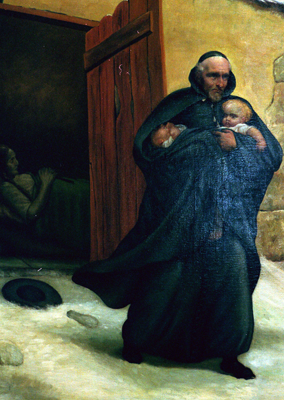 We Vincentians, both clergy and lay, are called be the bearers of this good news today; to share His sensitivity toward the poor, join with Him in his labor, and feel the compassion that throbbed in His heart as he reached out to those who were wandering and aimless like sheep without a shepherd. According to the words of St. Vincent, Our Blessed Mother, more than all other believers, penetrated the meaning and lived out the teaching of the gospel. We believe that The Lady of the Miraculous Medal appeared to Catherine Labouré in 1830 as a way of reaching out to suffering, discouraged and abandoned persons– as a great symbol of the graces she obtains for those who ask for them. The centrality of Jesus crucified in Louise’s spiritual evolution is evident from her earliest writings. Life had taught her that her vocation was to unite herself to Jesus on the cross. “I am going to follow you to the foot of Your Cross which I choose as my cloister.” Louise often wrote that the Daughter of Charity must strive throughout her life to know and to carry out God’s will for her. Louise turned to Jesus to provide the exemplar for the fundamental virtues of the Daughters: humility, simplicity, and charity. Also, Louise, as a mother, turns daily to Mary as the Mother of God, intimately united to her son in the accomplishment of the divine plan. St. Elizabeth had a deeply reflective and remembering life, awake and attentive to the God whom she met in the grace of each moment. Hers was a life of hope amid adversity; trust in a God of provident care became her lifelong practice. Psalm 23, which she learned as a child, remained her favorite consolation throughout her life of suffering and loss. Sustained and freed by her experience of God’s relational presence, Elizabeth was led to extend her love beyond her family to include all who came into her life.